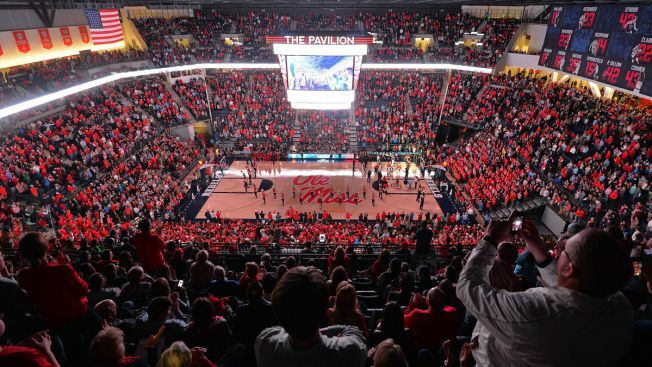 File: Fans fill the Pavilion at Ole Miss before an NCAA college basketball game between Mississippi and Alabama in Oxford, Miss., Thursday, Jan. 7, 2016. Eight University of Mississippi basketball players kneeled during the national anthem Saturday before a victory over Georgia in response to a Confederacy rally near the arena. With the teams lined up across the court at the free throw lines, six players took a knee and bowed at the start of the "The Star-Spangled Banner." Two other players later joined them. "The majority of it was just that we saw one of our teammates doing it and didn't want him to be alone," Ole Miss scoring leader Breein Tyree said. "We're just tired of these hate groups coming to our school and portraying our campus like we have these hate groups in our actual school." The Confederacy demonstration took place a few hundred feet from the arena. In the aftermath of violence at a similar rally in 2017 in Charlottesville, Virginia, the Oxford community has been on alert. Various student groups held counter-protests on campus Thursday and Friday. Saturday's march, led by Pro-Confederate groups Confederate 901 and the Hiwaymen, also drew counter-protesters. The march began at the Confederate monument on the city square and ended at another Confederate monument in the heart of the Ole Miss campus. "This was all about the hate groups that came to our community to try spread racism and bigotry," Ole Miss coach Kermit Davis said. "It's created a lot of tension for our campus. Our players made an emotional decision to show these people they're not welcome on our campus, and we respect our players freedom and ability to choose that." Kneeling during the anthem has become a popular way for athletes — starting with former NFL quarterback Colin Kaepernick — to protest racial injustice and inequality. Ole Miss beat Georgia 72-71.